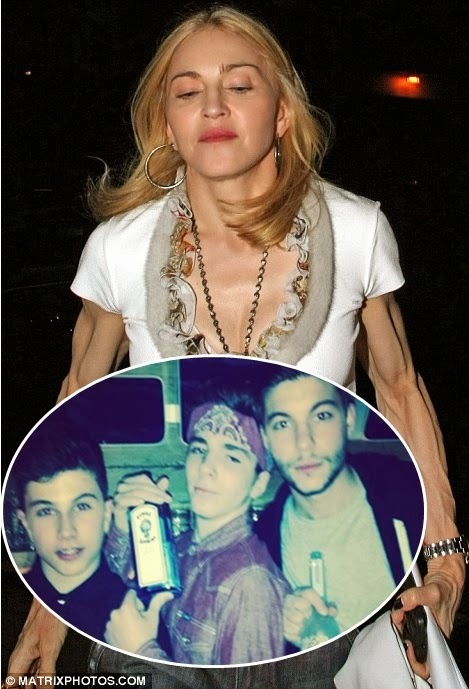 Madonna has been accused of promoting underage boozing after posting a snap online of her 13-year-old son holding a bottle of gin. Rocco, son of British film director Guy Ritchie, was photographed alongside two pals holding bottles of vodka. Madonna is in posh ski resort Gstaat, Switzerland, with her four kids Lourdes, 17, David and Mercy, both eight, Rocco and a group of close pals. The Instagram snap angered fans, with one commenting: “Dislike big dislike nothing like promoting underage drinking madonna duhhhhhhhh” and another demanding: “R they old enough to drink?”. The legal age for drinking in Switzerland is 16. Rocco posted a picture on his own Instagram site of him and a young male friend posing behind a drinks bar last week. He wrote: “Me and @dom_sesto work hard behind the bar tonight #faded”. It also emerged last month that Rocco posted a home-made video on his Youtube channel of him somersaulting off a balcony into a swimming pool with Madonna’s boyfriend Brahim Zaibat.